Courtesy of Muskan Wadhwa, Long & Foster – Wayne/Devon/Herling. This stunning 3-story townhome featuring 3 bedrooms 2.5 baths with a FINISHED BASEMENT and a FINISHED ATTIC is available for rent from May 18th, 2019. 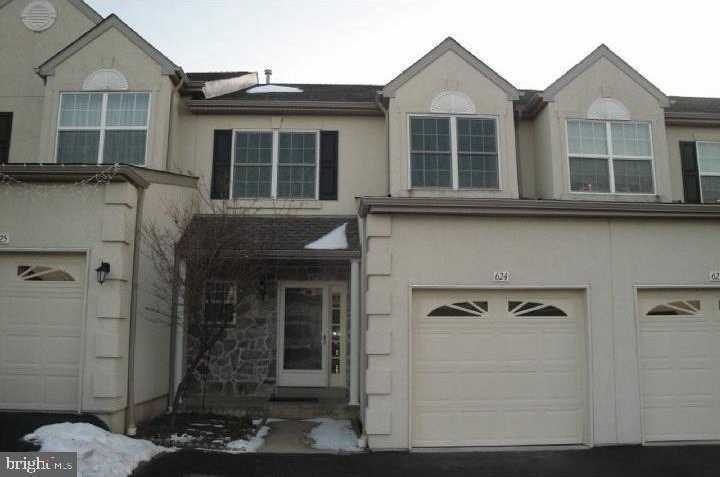 It’s located in the highly desirable DEER CREEK community right in the heart of King of Prussia. Walk into an open foyer with Ebony HARDWOOD FLOORING and 9′ ceiling; Open Kitchen with 42 upgraded cabinets, beautiful QUARTZ counter-top, GLASS TILED backsplash and TILE Flooring, under cabinet lighting and all STAINLESS STEEL APPLIANCES; Flows right into the spacious Living Room combined with Dining space featuring gorgeous Ebony HARDWOOD FLOORING, RECESSED LIGHTING, 9′ ceiling and a GAS FIREPLACE; The Bay window and the glass slider to the DECK brings in ample sunlight making the room bright & cheery; Slider opens to the rear deck. A 1-Car Garage and a Half Bath complete this floor; Driveway parking provides enough space for 2 more cars; The 2nd floor features a Master Bedroom suite with vaulted ceilings, a large WALK-IN CLOSET with CUSTOM CLOSET ORGANIZERS/SHELVING plus an extra standard closet; Large Master Bath with double-sink, Soaking Tub and a Separate Shower. Two more spacious bedrooms, hall bath and laundry complete this floor; 3rd Floor has a FINISHED WALK-UP ATTIC with a window; There is a large FINISHED BASEMENT with RECESSED LIGHTS, PERGO flooring and ample storage; Just move in and enjoy your Spring and Summer this year; There is ample guest parking across the road. Minutes to KOP Mall, restaurants and grocery. Close to Heuser Park, Valley Forge National Historical Park and highways 202, 76, 276, 422. Landlord pays monthly HOA; Tenant responsible for all utilities including sewage; Tenant needs to have Renter’s Insurance; Landlord’s requirement is that tenant must have credit score 700 plus.